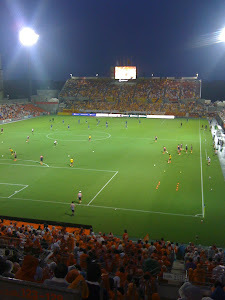 Last Saturday was the first Saitama derby of the 2012 season and it took place at the home of the Squirrels. Ardija have been struggling to find any form recently but what a way to cheer up the players, staff and fans with a win against your biggest rivals, the Urawa Reds. Prior to the game, the Reds were sitting pretty in the league, in second place, whilst the home team were in a lowly 13th place. Most tipsters were looking to an away win, and I wouldn't have disagreed with them. Those same tipsters would have been burying their heads in shame after the first half-hour , whilst I was half in joy and half in shock as the Squirrels raced into a surprise 2-0 lead through goals by Cho and Rafael. Despite some pressure from the Reds, Omiya managed to waste a few chances to get a third, but held on for a double whammy - a derby win and three very important points. Our first goal from Cho came in the eighth minute and the players worked the ball forward well on our left with some neat interplay passing and Cho got free of the Reds defence, turned inside the covering defender and slotted the ball home. The second goal came just before the half hour when Cho crossed the ball from the left wing perfectly for Rafael to finish with a smart header. Rafael seems to enjoy scoring against Urawa which is something the Omiya fans are very happy to see continue. Key pointers were having Higashi fit and back in the midfield, Cho being able to push forward from midfield and link up with Rafael, and finally getting the 2nd goal gave us a bit of a cushion upon which we could defend with more confidence than has been evident of late. A great win for Ardija, that saw us move up once place in the league to 12th place on 8 points, 5 points and 6 places behind the Reds. The worry for Ardija fans is that this was a one-off performance inspired by the visit of our crosstown rivals, and that we will soon dip again. The good news is that the next visitors to the Nack5 on Saturday April 28th are bottom placed Consadole Sapporo. Is this a chance for the Squirrels to post back to back home wins? Let's go Omiya Let's go!